Our main spheres are mural and icon painting of various kinds (cellular, lectern, family, signature, measured, travelling, temple icons and iconostases). Our competitive advantage is that in our work we strictly follow the traditions of Palekh icon-painting. One of the most important working stages is when a wooden intermediate product is selected. It can be made either of common or of fine wood. All materials are utterly conditioned and then dried properly. The second stage is applying the prime coating which is mainly gelatin-based and is applied in several layers, every of which is properly dried before applying the new one. After the prime coating is done the icon surface is polished to reach a certain glossy condition. At the customer’s demand the icon may have compositional incusing at the margins, in the background or on the halos of the saints. Next the icon is gilded, which gives it a touch of a genuine masterpiece. Glossy gilded surface is a traditional feature of a Palekh icon, whose secret has been kept by generations of icon painters. Also, the ornaments on the gilded surface may have some enamel elements, the technique of which is also considered one of the secrets of the trade. The elaborateness may vary from icon to icon: it may contain incuse work, enamels, it may be a single half-length image or a detailed many-figured composition. The painting is done in egg tempera paints dissolved in the domestic egg yolk emulsion. 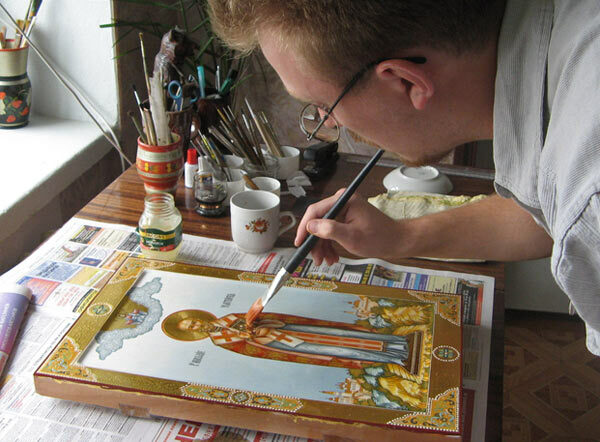 The icon painting is carried out by several painters: the first one applies the primal color coatings working on the background, landscapes, margins, clothes and underpaint. Then the icon gets into the possession of a pre-face painter whose responsibilities are details on clothes, shade strokes, which can be done in paints or gold. The most important stage of the work is painting a saint’s face. This work is done by a professional face painter. The utmost attention is paid to the elaboration of the hair and the beard of a saint. The final stage is polishing and finishing, which carefully follows the strictest technological demands.